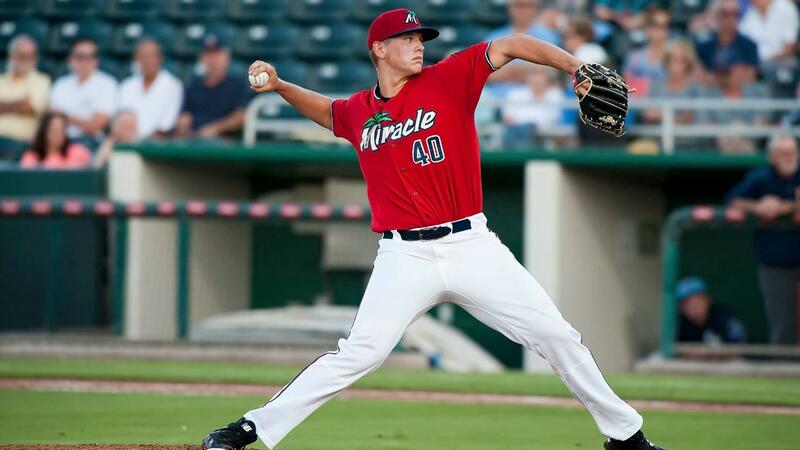 Twins prospect Tyler Wells delivers a pitch for the Fort Myers Miracle during the 2018 season. He was a sophomore in high school when his father, Jeff, got him out of class, his dad's face flush with sadness. He informed Tyler his grandmother had died. Wells, now a rising prospect with the Minnesota Twins and soon-to-be-member of the Pensacola Blue Wahoos, had already lost his mother to leukemia when he was 4-years-old. On this late-spring day in 2012, his grandmother, the one who helped raise him back in Oklahoma, was suddenly gone too. "I just broke down right here. I mean, we were extremely close. My grandmother was my best friend." He remembers mourning with his father, a former Golden Gloves boxer in his youth, until the tears stopped and Tyler said, "I'm still pitching tonight." They went back to his school, University High in Morgantown, West Virginia, where Tyler lived with his dad and stepmom, Tonya, at the time. They got his gear, then headed out for the crosstown road game. "I think that was the day when you really start to realize, wow, I can really do something with this," said Wells, taking a break from daily workouts in Fort Myers, where the Twins will soon begin spring training. "That's when I thought about a future in baseball. "It was one of the few times I have seen my dad cry." He was drafted by the Twins in 2016 from the University of California-San Bernardino. He's been on an upward trajectory ever since. Wells will be introduced to Pensacola and Blue Wahoos fans on Thursday at the Twins Winter Caravan Pensacola at the Studer Community Institute on Garden Street. The free event at 5 p.m. will include Wells and pitching teammate, Delvin Smeltzer, who overcame cancer and will be profiled later this week. His community service efforts, combined with helping the Fort Myers Miracle win the Florida State League (Class A-Advanced) championship last season, earned him the Twins' prestigious Harmon Killebrew Award, created to honor the memory of their Hall of Fame first baseman and given to players in the organization that best exemplify Killebrew's legacy of community service. "Tyler is a guy who looks to make people smile," Zoll said. "He looks to find ways to make life easier for everyone and wants to keep things light and it's pretty easy to be around him at all times. He's a great kid," Zoll said. "He not only performs well on the field but spends a lot of time contributing to the community away from the field and is really trying to get the most out of himself." He was 10-6 with a 2.49 earned run average in 2018, which included a second-half move up to the Chattanooga Lookouts, then the Twins Double-A affiliate in the Southern League. "I think it was a huge step for me in the right direction," Wells said. "I think a lot of it had to do with my last off season (heading into 2018). And really being able to put my body into a good place. "Once I was able to get my body into shape is when things started to go my way. I was able to progress as a pitcher." The progression earned him the TwinsDaily.com award as Minor League Starting Pitcher of the Year and a recent promotion into the Twins Top 30 prospect list on MLB Pipeline. There are plenty of military connections in Wells' life. Both his grandfather and great uncle are U.S. Air Force veterans. "Pensacola, in general, from what I understand being a military town, it gets me pretty excited," Wells said. "Because I have a pretty rich military history within my family, so for me, it is super exciting. "I am big supporter of the military. It's exciting to be in a town where the military is such a big part." Blue Wahoos team majority owner Quint Studer and minority owner Bubba Watson have made major contributions to the Studer Family Children's Hospital at Sacred Heart. "Whenever it comes to visiting kids and hospitals, it is hard to be able to say the right things," Wells said. "These kids are going through something that most people just can't even fathom or understand. "I really try to show them they have a friend… they have someone behind them the whole time. "It really humbles me to be healthy and the way I am. It helps me more grateful every day for the people I have in my own life and for what I am doing. It drives me to be better person each and every day." His goal is to help find a cure for leukemia and other forms of cancer that bring so much anguish to families. He has little memory of his mother, Chasity. When she died, he and his younger brother moved in with his grandparents and lived nine years in Oklahoma. His dad remarried. After initial reluctance, Wells became very attached to his stepmom, whom he now refers to as "Mom". Tonya is a native of Morgantown, West Virginia, which is where the family lived in his early years of high school. She then accepted a position in California and Wells spent his final two high years at Yucaipa located near San Bernardino. All the adversity he's dealt with as a kid has shaped Wells' outlook on baseball and what it means to be a professional athlete. Baseball was always the sport he loved. When he won the Harmon Killebrew Award, he immediately did research on the Twins' iconic slugger. "It is hard to put into words sometimes for someone like me to go through a lot of the stuff I did as a young kid," Wells said. "I thought about it whenever I became a professional baseball player. I always thought of it as being more than just a baseball player. "I think that's one of the things Harmon Killebrew represented really well… is you're not just a baseball player, you are a figure. "You are someone who can really change someone's life by just one encounter." It's how Wells has tried to live his life. WHERE: Studer Community Institute on 220 Garden Street. WHO: Twins general manager Thad Levine, Twins director of minor league operations Jeremy Zoll, new Blue Wahoos manager Ramon Borrego, plus pitching prospects Devin Smeltzer and Tyler Wells. Also attending will be Pensacola authors Scott Brown and John Appleyard, presenting the city's unique and historical legacy in baseball. FORMAT: Autographs with Twins guests, question-answer session, ballpark food samples provided, special announcements from Blue Wahoos.